Elevation : Near sea level ; ---. Surface Area of City Prefecture (Municipality) of Kathmandu: No Data. Population of Kathmandu : No Data. The city today known as Kathmandu - no information available. Although Kathmandu today is a brand new and modern city most of which has just recently developed, there are plenty of Landmarks and Monuments to visit and marvel at. Kathmandu City - no information available. Prohibited items in Nepal - No information available. Passengers should confirm with their airline of travel for further information and refrain from risk seeking behavior. 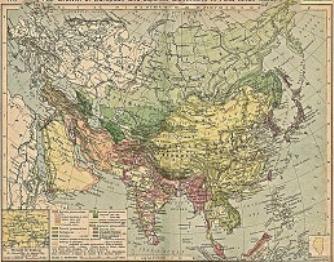 A Map drawing of the World depicting the Colonial Possessions as they were distributed in 1912 AD. Superimposed and marked in colors are subsequent changes in Influences Spheres, colonies and possessions due to World War I ( 1914 AD - 1918 AD). Included in this Map are the main cities across the continents with their brief histories and events during the late 19Th Century and early 20Th century, where relevant. Marked in Colors for clarity are the various colonial and imperialist Nations. As relating to China; special attention is payed to so called Treaty Ports. The First Treaty Ports were forced open by Britain in the year 1841 AD, but counted over 80 in total by the end of the 19Th Century. No information available. See Section: "Transport in Kathmandu". Google supported Map of Kathmandu City in the Democratic Republic of Nepal, by AsiaReportcom. A listing of all available Maps relevant to Kathmandu City, the State of Nepal and the Himalayas. Satellite Image Maps, Historic Maps, demographic maps, etc.